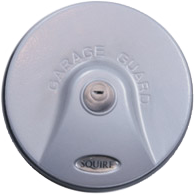 The GarageGuard security unit is the perfect solution for making your T-Handle garage door more secure. 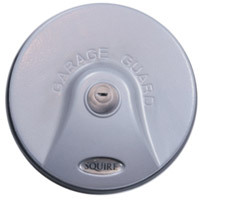 The Garage Guard is a visible deterrent to any intruders as they can clearly see that you and your family have "locked" your garage door, there are no need for DIY skills when it comes to fitting the Garage Guard, the unit is lightweight and easy to fit. Due to its lightweight design and easiness to apply to your T-Handle garage door, there is no hassle and frustration about taking it off when getting anything from your garage. 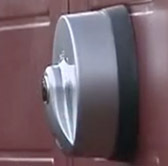 Having the Garage Guard on your garage door allows you to leave your house knowing that the garage is safe and sound. 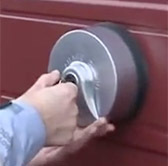 Your garage door T-Handle is now secure. Please note that the Garage Guard spins freely once fitted making it more resistant to attack.